The Black Bach (formerly La Maison du Nautica) holiday home, has a large open plan living area, which comprises of the kitchen, dining and lounge area, which flows out onto the expansive deck. The wraparound decks enjoy the morning and late afternoon sun as well as a delightful view over Matauwhi Bay. Sleeping up to 6, the house comprises 3 bedrooms (2 with super-king size beds and 1 with twin singles – can be made into a super-king-size bed as well), 1 en-suite and 1 full bathroom, with a bath for those very special relaxing evenings. For those cooler months there is a wood burner fire place, (wood supplied) in the lounge, a 42” LCD TV, WI-FI, library of DVD’s and iPhone dock, My Sky TV includes all local NZ channels, plus news, documentaries, lifestyle, sports and movies etc. Please note: For your comfort the house is pet free and is non-smoking property, you are more than welcome to smoke outside. The house itself was beautiful and fit our family of 5 comfortably. Located within walking distance to town which is always a plus. Most importantly it was clean. Only downside, it was double the price of an equal home we stayed at in Russell the week prior, but was missing key things most people don’t travel with; like hand soap. Wonderful property, beautiful views, a lovely place to stay. Wonderful property, beautiful views, a lovely place to stay. Easy walking access to town. Our second stay and was just as perfect as our last. Our second stay and was just as perfect as our last. 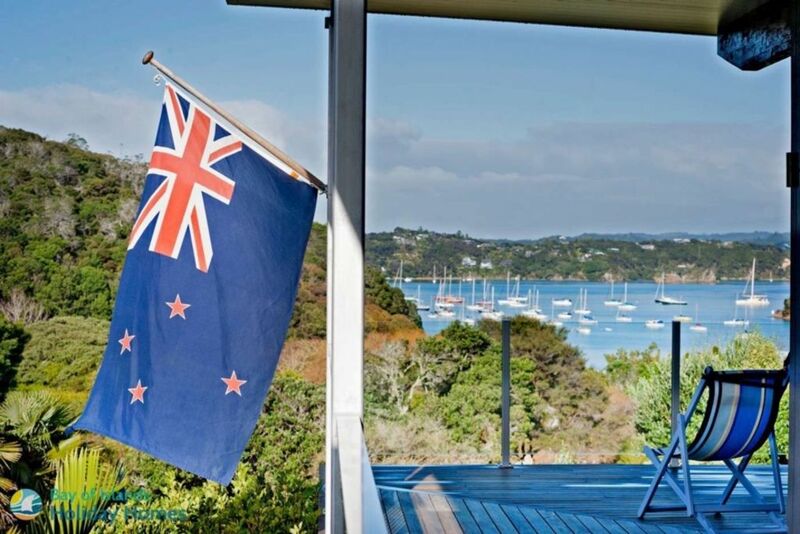 The Bach is in a lovely location just 10min walk out of Russell with views over Matauwhi Bay. Very spacious, quiet and is equipped with everything you need. Lesley and Barry were very efficient and helpful with sorting out a few maintenance issues. We will definitely be returning, thank you! Absolutely gorgeous house with stunning views! Absolutely gorgeous house with stunning views! Loved the spaciousness and flow of the house - something that you can't really see from the photos. The interior is beautifully decorated and has a clean, fresh and modern feel. Heating was excellent and consisted of a wood burner fireplace and heatpump. The house is very well equipped with everything you need for a comfortable, relaxed stay. We will definitely recommend this property to others and hope to return again for another wonderful stay. Beautiful modern Bach with lovely view and well appointed. Booking process easy with no issues accessing the property on arrival. Booking process easy with no issues accessing the property on arrival. Stunning views of Matauwhi Bay from the large, west facing deck. Easy 15min walk into Russell for that important caffeine fix and provisions. Moderate 20-30min walk to Flagstaff Hill and Longbeach. Sufficient space at foot of drive to park a 7m boat which made things easier and safer from a security point of view. We really enjoyed our stay and would not hesitate in staying here again or recommending the property to others.